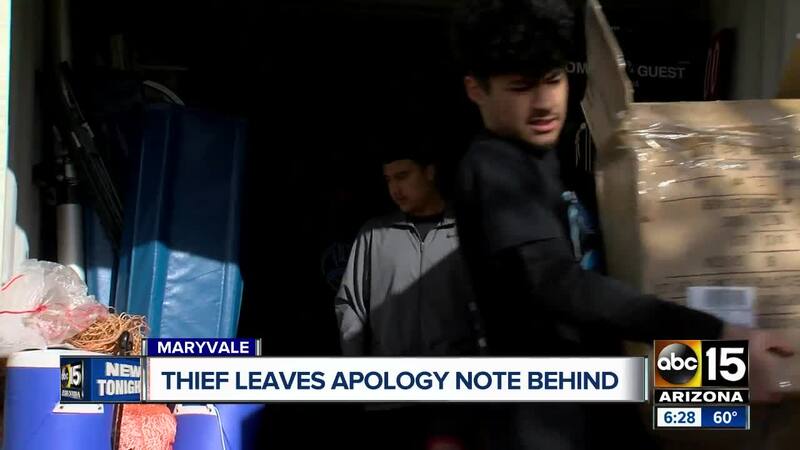 A thief that broke into three storage sheds at a West Valley high school wiped out all of their sports equipment and expensive tools, but they also left behind a note apologizing and explaining why they committed the crime. PHOENIX — A thief who broke into three storage sheds at a West Valley high school wiped out all of their sports equipment and expensive tools, but they also left behind a note apologizing and explaining why they committed the crime. Adrian Espana, the Community Coordinator and Athletic Director at the Western School of Science and Technology near 67th Avenue and Indian School said the break-ins took place during their winter break. Espana was with a group of athletes on Saturday morning cleaning up the mess and taking inventory of the missing items. "They cleaned us out for sure," Espana said. He said every sport on campus was affected by this burglary. "Soccer balls, baseballs, volleyballs, all of our baseball equipment, some of our P.E equipment, football cleats, under armor, jerseys, running shoes. They're all gone. I know the soccer team and baseball team are worried about having equipment for the season because it starts in a month," Espana said. Another storage shed containing bins full of tools was also broken into. All that was left there were empty bins, a few pairs of eye goggles, and a pair of work gloves. Espana said on the ground by the shed, they found a note from the thief. The note stated: "Hello manager, please forgive me for taking what doesn't belong to me! I cannot let my little sister go hungry because of my fault!" The apology and explanation did not sit well with athletes and staff. "You don't have to steal other people's stuff that we worked hard for," said Adan Zapien, a high school junior and football player at the public charter school. "They were apologizing for taking the stuff, but them taking the stuff from the school is not really taking from the school. It's taking from the students," Espana said. He explained that students had worked very hard to earn the money to buy some of the athletic equipment. "It is very disappointing. The things we have worked for came from grants we have written, some of it was donated to us. The students are the ones who put all of the hard work in, doing car washes every other week, doing any fundraiser they could to raise the money for our athletic program," Espana said. The school does have surveillance cameras. Espana said Phoenix police had been notified and would come by to review the footage next week.